Most of us take breathing for granted. But patients with asthma, bronchitis or other breathing conditions know its importance - along with the respiratory therapists who care for them. At St. Luke's College, you will learn to evaluate, treat and care for patients with breathing disorders. 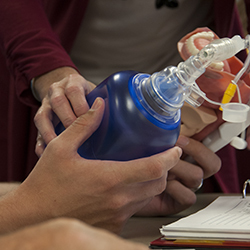 Respiratory therapists evaluate and treat all types of patients, from the tiniest of patients in the critical care nursery whose lungs are not fully developed to elderly patients whose lungs are diseased. Graduates are eligible to write the national examination for state licensure to become credentialed as Certified Respiratory Therapists (CRT) and Registered Respiratory Therapists (RRT). St. Luke's College offers a $1,000 Respiratory Care Scholarship for students enrolling in the Fall class. To assist the student in developing professional and ethical behavior and applying those skills in a global society. To offer a program integrating clinical and didactic education to meet the educational needs of diverse learners.